NOTE: It is time to nominate businesses for the 2016 DREAM BIG Small Business of the Year Award, and community involvement is a key component. Glenwood Caverns Adventure Park – a 2015 DREAM BIG finalist – hosts a Music on the Mountain Can-for-a-Tram Concert Series to support the local LIFT-UP food pantry and has collected over 42,000 cans since 2009. Apply for the 2016 award and challenge businesses in your community to donate time, money, or resources through #bizgiving on Twitter. Glenwood Caverns Adventure Park offers cave tours, tram rides, and other attractions in Colorado’s once-closed historic Fairy Caves. A dream 16 years in the making, the park attracts more visitors and raises more revenue every year. It was love at first sight for Steve Beckley with the Fairy Caves—but it took awhile for the first sighting to happen. Steve read about the location in a Caves of Colorado book back in 1982. The site was previously open for tours but closed in 1917. Steve began regularly writing Pete Prebble, then-owner of the caves. It took 10 years before the men met face-to-face—but a friendship grew. Eventually, Pete took Steve to the caves, and “after exploring the cave that first time,” Steve says, “I knew that sharing it with more people had become my dream.” Pete agreed to lease Steve the caves in 1998— with an option to buy in the future. Steve immediately embarked on that dream and moved from Denver to Glenwood Springs to prep the site. His wife, Jeanne, pregnant at the time, wasn’t far behind. She was in the caves helping as soon as their first child turned 3 weeks old. The mountain attraction with 3.5 miles of passageway is located between Aspen and Vail, and it has continued to add attractions over the years. “We’re 108 feet below the surface, so above us there is a full theme park that has 12 rides, roller coasters, giant swings, Ferris wheels, a restaurant, and a bunch of other amenities,” Steve says. This cave has been here for several million years. It is my pleasure to share it with the public, but share it in the way that it’s pristine, and make sure that it is exactly the way we found it. What’s the company’s philosophy with community involvement? The park’s approach is simple: “Our policy is that if a local group or organization asks for our support, the answer is always yes.” In 2009, the park started a Music on the Mountain Can-for-a-Tram Concert Series to support the local LIFT-UP food pantry. Guests donated canned food at the free concert held at the top of the mountain. Over the years, Glenwood Caverns has collected 42,000 cans, including 12,427 this past year. The concert series has become so popular with locals that it won a gold award for best live music venue and a bronze award for best community event. The site claims the highest-elevation roller coaster in America and the fist alpine coaster in the United States. the giant swing sweeps riders 1,300 feet above the Colorado River. 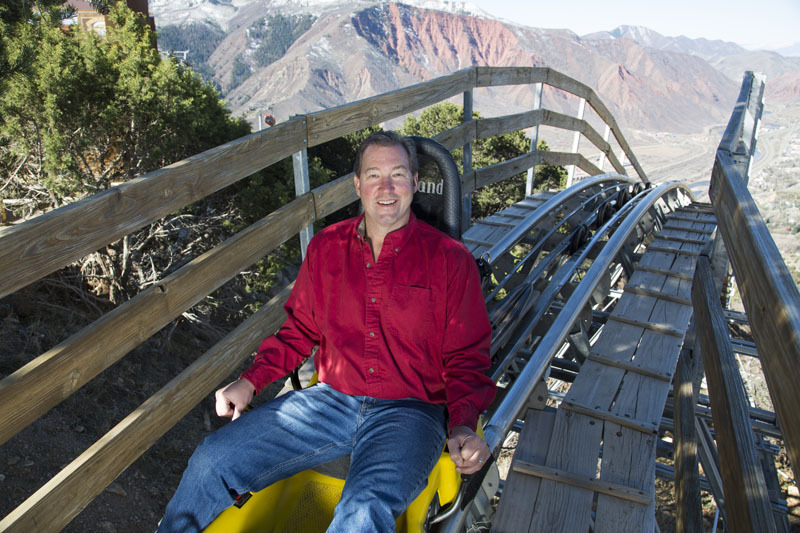 WHAT’S AHEAD FOR GLENWOOD CAVERNS? Expansion continues at Glenwood, with more rides and attractions for the whole family. But Steve always works to ensure that things are done in a respectful way to the mountain and the caves. A new partnership includes the acquisition of 13 acres on the Colorado River at the tram base, and the Iron Mountain Hot Springs will open this summer. The DREAM BIG Small Business of the Year Award, sponsored by Sam's Club, celebrates the success of small business and honors its contributions to America's economic growth. The winner, seven regional finalists and 100 Blue Ribbon winners will be acknowledged on June 9 during America's Small Business Summit in Washington, D.C.